We’d love your help. Let us know what’s wrong with this preview of S. by J.J. Abrams. A young woman picks up a book left behind by a stranger. Inside it are his margin notes, which reveal a reader entranced by the story and by its mysterious author. She responds with notes of her own, leaving the book for the stranger, and so begins an unlikely conversation that plunges them both into the unknown One book. Two readers. A world of mystery, menace, and desire. S. , conceived by filmmaker J. J. Abrams and written by award-winning novelist Doug Dorst, is the chronicle of two readers finding each other in the margins of a book and enmeshing themselves in a deadly struggle between forces they don’t understand. It is also Abrams and Dorst’s love letter to the written word. To ask other readers questions about S., please sign up. Hello peeps, I have had this book for a few weeks now but I have yet to get around to read it. I seem to be a little...hum...intimidated about it. Where do i start to read it, do I read the story first before concentrating on the note's within or do I read the transcript's along with reading the story? To anybody that has read this novel, what would you suggest? Any comments will be graciously received. After reading through the foreword (with all the notes, no matter the colour), I did a little research on how to go about this…moreIt's fantastic!!! 1) Read through chapter (and pencilled notes). 3) I finished the whole book this way yesterday and have now started going back to the beginning to read the next notes, which are in orange and green. 4) After that, I'll go back (again) and read the notes in purple & red. 5) And again in black & black. I haven't figured out how to use the decoder yet...hoping that gets explained in a note. Some people take each one out and put a post-it on them with its page number, but I didn't. I haven't delved too terribly deeply into a lot of the other stuff, though, because I did find a spoiler. If I finkshed reading the chapters, why would I want to read the notes? Mariana Schneider The notes make a COMPLETELY different book, they just happen to share the pages. Different plot, characters, and especially a different ending. As a tutor of homeschooled students in my community, I have to fight against a certain proclivity when reading books: no writing or marking them! The parents generally won't allow their children to "damage" the books, so they can be reused by younger siblings or resold to other homeschooling families. This rule eventually becomes the norm for the students, and as they grow older they have an ingrained objection to writing in books. I have and will continue to argue that they should mark up their As a tutor of homeschooled students in my community, I have to fight against a certain proclivity when reading books: no writing or marking them! The parents generally won't allow their children to "damage" the books, so they can be reused by younger siblings or resold to other homeschooling families. This rule eventually becomes the norm for the students, and as they grow older they have an ingrained objection to writing in books. I have and will continue to argue that they should mark up their books. It is a way for them to have a conversation with the author, but it is also a way for them to have a conversation with those who might read it after them. 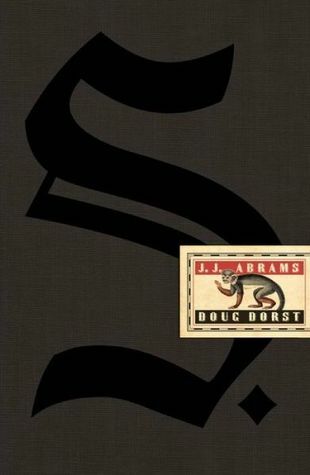 S. by Doug Dorst and J.J. Abrams is the novelization of such a conversation. 1. First, read the novel itself, The Ship of Theseus. (It may be worth researching the ship of Theseus from Greek mythology.) Depending on your own attentiveness, you might read the whole novel first, then the annotations, or read a chapter at a time, then the annotations, or the facing pages then the relevant annotations. 2. Then, read the pencil, black, and blue annotations. 3. After finishing the entire novel and the above annotations, then read the green and yellow annotations. 4. After reading all of the green and yellow annotations, read the red and purple, then the black and black annotations. 5. As you read the annotations, look at the slip notes, if they make sense with the annotations you've just read, then finish reading it, if not, then wait until the next round of annotations. 6. The slip notes fall out very easily, it is best if you take them all out and label them with sticky notes identifying which page they were on. Keep them nearby as you read and watch the page numbers. As you read this way, you will discover that a boy named Eric read this book and annotated it in pencil. At times, he'd go back and annotate it further with black ink, but around this time a girl named Jen found the book in the library and began adding her own annotations in blue ink. The annotations become a conversation between Eric and Jen who write notes then leave the book to be discovered by the other. The novel itself, Ship of Theseus, is an interesting story, but the annotations become a story themselves. You end up reading a novel within a novel as you read through S. It can be confusing, though, because of the color-coded annotations are not always in chronological order. Sometimes, as you are reading, you will find a green and yellow annotation that doesn't seem to make sense until another set of green and yellow annotations on a later page explain it. This is because the two readers are making annotations according to what's in the text that reminds them of certain events in their own lives. You'll just have to live with this. But, it is better to not read all of the annotations, regardless of color, on a page because the later annotations will give a lot a way. That's why I recommend following the color-coding above. As far as the two stories themselves, they are very interesting. They will keep you curiosity piqued as you read, but this is the brain child of J.J. Abrams, of television show, Lost, fame. If you are familiar with Lost, then you will know that Abrams is not interested in answering all of the questions. Much of what you read will not be answered as you read. I do have one suspicion though, and if you are inclined to follow this out, I'd love to hear what you find--either in comments on Goodreads or on my blog. I think there may be codes in the Ship of Theseus footnotes that do answer these questions, but they are codes that Jen and Eric could not or did not figure out. Specifically, in my copy (and I need to confirm that this is in all copies) the later footnotes have a weird printing problem where some letters in the footnotes are bigger than others or look like a kind of subscript or superscript. I wonder if those oddly printed letters might be a code of themselves. If so, they'd be one that Jen and Eric didn't mention in their own notes, but they may also just be a printing error in my copy. Not sure which. Sue Thank you for the guide to the reading order. I’m about to start the book this week and was confused about how to tackle it! Marsha Iddings Thank you for this guide. I got so bogged down trying to read everything at once that I gave up. I’m going to give it a fresh start and try again. This review has been hidden because it contains spoilers. To view it, click here. I just closed the book after finishing the final chapter. I'm profoundly confused and unsettled. I think I may have to go all the way back to the beginning, and read the margins again, going in chronological order (according to the colors) to piece together Jenn and Eric's story. I thought I'd figured out who Straka was, and *why*, but (likely because I put this book down for months) I lost the plot. I think a rereading of the margins will refresh my memory and pull it all back into focus. I like I just closed the book after finishing the final chapter. I'm profoundly confused and unsettled. I think I may have to go all the way back to the beginning, and read the margins again, going in chronological order (according to the colors) to piece together Jenn and Eric's story. I like the idea that S. will reward subsequent readings, will reveal different details that I overlooked the first time through, but I don't like feeling that I don't have time to find them all. I wonder what it's like to be JJ Abrams. Does a trip to the supermarket become a frantic sortie into a grocerian wilderness? Do battles rage between produce and deli, with stalks of celery raining like arrows upon quivering chunks of roast beef and aged Vermont cheddar? Are the pizzas lurking in a control room behind the freezer case, broadcasting shortwave signals that force the croutons, lemminglike, to hurl themselves from the shelves to the floor where they lie, helpless, waiting to be crushe I wonder what it's like to be JJ Abrams. Does a trip to the supermarket become a frantic sortie into a grocerian wilderness? Do battles rage between produce and deli, with stalks of celery raining like arrows upon quivering chunks of roast beef and aged Vermont cheddar? Are the pizzas lurking in a control room behind the freezer case, broadcasting shortwave signals that force the croutons, lemminglike, to hurl themselves from the shelves to the floor where they lie, helpless, waiting to be crushed by the wheels of an approaching cart? And Abrams seems to have found a kindred spirit in Doug Dorst, for the two of them have created something imaginative and beautifully original. It's not an easy read--I don't think I've worked this hard since Absalom! Absalom!-- but it's an engaging one. There are basically three stories taking place here: the central novel, Ship of Theseus, written in the 40's by V.M. 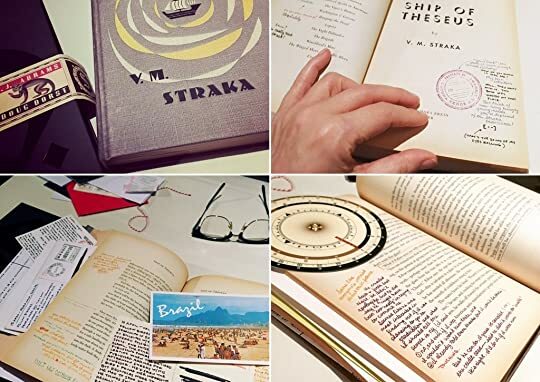 Straka; the secret messages to his friends that Straka appeared to be hiding in the novel, as they were apparently working to disrupt the workings of a major weapons manufacturer; and the unfolding love story between two college students reading the book in our time. As a reader who firmly believes that an author's bio is critical to a complete understanding of a work, I found many of the questions raised in this book intriguing. "Identity" is its central theme, and as such, these stories address identity at enough levels to be mind-boggling or nearly so. It is also an identity issue that created the story's largest problem for me. The central character in Ship of Theseus is a man with no name, no past, and little control over what he must do next. That makes it hard to care about him, about what happens to him, and about what he does. And I find novels where I don't care about the characters, to be novels that leave me cold, no matter how horrific some of the things are that he endures. Fortunately for S, the protagonist in Ship of Theseus isn't its only character. The other two leads, Eric & Jen, are people we come to know well, and care about a lot. They are eventually as open about their feelings and dreams as the other fellow is closed in his. They rescue this book from what could have otherwise been an exercise as frustrating as the latter part of the second season of "Lost" (e.g. "when I stopped watching"). The book ends the only way it can, but you won't feel gypped. S. By J.J. Abrams is a beautiful hardback carefully distressed to look like an old Library book with its old book smell and stuffed full of notes, postcards, papers and bits and pieces. When I received this book in the post I was pleasantly suprised with the faboulus concept and design. I loved the idea and could not wait to start this novel. I loved the margin notes to begin with and was fascinated to see how this story would play out. I have to admit for all its gimmicks I soon found myself wondering is this book was just a pretty and fancy concept as I found the story quite disjointed and difficult to follow. It is a very slow read as there are two stories here. We have Jen and Erics story written in the margins of the book and the story of The Ship of Theseus in the main part of the book. I found it quite tedious to read the story within the book, then read the story within the margins and all the extra bits and pieces inserted throughout the book. To begin with this was intriguing and exciting but after about 80 pages I got bored of the book and its gimmicks and really found myself hating picking up this book to read as it was just too time consuming. The concept, and design of this book is an excellent idea but for me there was not a strong enough plot to jusiify more that a 2.5 star rating. If I was rating the book on its presentation and design, I would certainly give it five stars. But plot and writing is everyting to me and the phrase " All Flash and no substance" came to mind many times throughout this book. Okay, actually, in my mind it's more like 9.5 as I had some quibbles with the last chapter, however "9.5 stars" didn't quite sound right for a heading. Reading this book was an "Experience". There was pure joy for me in this act. What more could anyone ask? I haven't even broken the seal on this and I'm wetting myself. It looks amazing. There's even a very realistic looking library sticker on it. I might have accidentally taken most of the day off to finish reading this book, and now I have a lot of feels. There are a lot of things that I could say about this book, and I almost wish that I could go back to my freshman English class where we studied nested narratives and I wrote a paper about The Neverending Story, so that I could write about this instead. If I can compare this book to anything, it would be House of Leaves. I've always enjoyed non-linear and experimental narrative forms, a I might have accidentally taken most of the day off to finish reading this book, and now I have a lot of feels. There are a lot of things that I could say about this book, and I almost wish that I could go back to my freshman English class where we studied nested narratives and I wrote a paper about The Neverending Story, so that I could write about this instead. If I can compare this book to anything, it would be House of Leaves. I've always enjoyed non-linear and experimental narrative forms, and I would so much like to see MORE of books like this. The way that this book is put together is so intricate and seamless that you don't even realize how extraordinary it is until you go back and look at it. 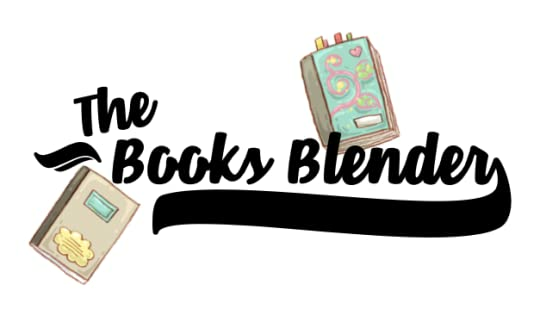 But not only are the different stories nested (the novel, the mystery, the readers), but Jen and Eric's story is told in chronological layers as well. And somehow it was clear very quickly what these layers meant and how to read them. I've seen suggestions to read the notes chronologically (i.e., the blue/black notes first, then the orange/green, then the red/purple, then the black/black), but I respectfully disagree. I read the entire book through page by page, and I THINK that this was probably as intended because of the suspense build. Having the foreshadowing of events to come was what made it a page-turner - I knew bits of what was coming, and had to know the journey to get there, and so I just couldn't put it down. I can, however, see the value in reading just The Ship of Theseus first (or perhaps reading it first chapter by chapter). I admit I did not pay nearly so much attention to the novel as I did to the readers' interpretations of it. I love that this novel is a love letter to the printed page - a piece of art that could never be well translated to an electronic version or to audio. I was totally giddy upon opening it up and seeing what was inside, how complete the illusion is. The experience of reading is completely immersive - you can imagine that you've found this book in library donation bin many years later. It makes YOU and your experience of reading it another character in the story. This has been such an amazing, unique experience. I wholeheartedly applaud J.J. Abrams and Doug Dorst for creating this puzzling, entertaining side of literature. Everything was so well developed, every facet coming together in such a satisfying way. Prose, notes, postcards, pictures, maps, newspaper articles, codes… This was not just a book. It was a project. A bold one at that. It was almost entirely perfect were it not for the Obituary. Being Brazilian, one of my biggest pet peeves – in books, movies, TV series – is when they depict Brazilians speaking Spanish. We don’t. And Abrams/Dorst thankfully used Portuguese when Brazil was involved in the storyline. In all of it, but a little piece of the Obituary, which was all in Portuguese except for 12 little displaced Spanish words left unnoticed by the editors. I know it seems like nothing, but in a book like this, where every minor detail counts toward bringing the whole story together, it broke the magic a little bit. Other than that, it was flawless. It was an ode to literature and mystery, and I had the most awesome time reading it. In a process much like Inception, the reader got to dive deeper and deeper, finding a young Eric, inside Eric and Jen, inside Straka, inside Ship of Theseus, inside S.
During the winter of the year 2013, while residing in Dubai, UAE, I casually made the acquaintance of S.. I gazed at S. wonderingly - bathed in the full knowledge of S.'s origins--Abrams royalty. Conceived by JJ and brought to life by his partner, D Dorst, their imaginations were singularly vigorous and creative. S. no doubt derived additional force in this world from such privileged entry, albeit from a long and arduous labor. S. was rema A tale of S.
S. was remarkable in every respect, and excited in me a profound interest and curiosity. A handsomely presented specimen, unlike anything seen before, I was eager to know S. better. There was something about S. that bewitched me; thrilled me. The mere sight of S. sent me in to a dream, turning my back on the world of waking consciousness. Could S. introduce me to a sphere of mystery, menace and desire? I found it almost impossible to explain S. in both convention and appearance. Fully cloaked in a fierce black covering and sealed in a translucent sheath, S. looked formidable. There was a moment of pure exhilaration when S.'s sleeve exposed a glimmer of classic refinement. My eyes grew bright to a degree almost inconceivable and my face was aglow with girlish delight. Spurred on by the impulse of desire, I gently removed S.'s coverings. What I saw perplexed me in no little degree. While S. certainly seemed elegant on the outside, beneath the layers I had little trouble imagining S. to have had a very hard and difficult life. S. emitted a strange musty odour and bore a putrid yellow complexion. S.'s skin looked dull, battered and in various degrees of distress, and tattoo-like images covered S.'s back. It seemed that physically S. had not always been this way but somehow had been reduced from a condition of more than usual beauty to what now lay before me. I soon, however, grew accustomed to these features. With tenderness, respect and understanding, I touched and caressed S., while being mindful not to harm the edge-worn, scuffed and dented body. There was simply no denying it; I felt an immediate connection. Within our first few hours together, S. and I were constant companions. Little by little a very distinct magnetic relation existed. I began to delight in the multilayered and complex S. While at times S. was difficult to work out and understand, for the most part S. was exciting--different--unexpected. I could see that there was a whole lot going on within this complex S. package. Before long S. took on multiple personalities and I followed the musings of these identities with much interest. First S. unveiled the identity of V. M. Straka, an author of the book "Ship of Theseus". There's mystery surrounding Straka's identity as well as the identity of his translator, F. X. Caldeira. Next S. unveiled two other identities; a college senior (Jen) and a former graduate student (Eric), both literary majors. Their stories unfold simultaneously and then intersect, all within the pages of Straka's novel. I try valiantly to eavesdrop on these conversations. S. provides me with postcards, photographs, newspaper clippings, letters—even a hand-drawn map written on a napkin from a coffee shop; clues that may help me to discover hidden messages and codes. After sharing several (long) days and nights with S., my initial excitement turned into one of wariness. It was clear that S. was trying to make me understand the internal logic governing 'what' is said and 'when' by each of the personalities. Given S.'s inability to integrate the various aspects of identity, memory and consciousness, it was up to me to unleash that dilemma. An indescribable uneasiness possessed me. I feared to progress further, lest I should be precipitated into some abyss. I began to rethink my relationship with S. The scenery which initially presented itself had now become all too much. Overcome by exertion (and exhaustion), and by a certain oppressive closeness, a feeling of animosity existed between us. I have since parted ways with S.
It is apparent that S. has wasted no time in moving on, experiencing close connections with others. I bear S. no ill feeling and send my best wishes for fulfilling and sustainable relationships in the future. However, if you have yet to come across S., heed this warning. S. is high maintenance and demands a tremendous amount from you. If you’re not prepared to give every inch to work alongside S. in examining each and every one of the personalities and clues, it’s probably for the best that you don’t begin. It's all or nothing and no in-between. S. will remain for me one of the most staggering feats of production I have ever witnessed. S. combines mystery, literary analysis, innovation, tradition, adventure and love in an exquisite package. While our relationship didn't last, I consider it a privilege to have spent time with S.
It's hard to write this review without spoilers, but I'm trying to keep it interesting for other readers. If you're a tad philosophical, this book is for you. (Ship of Theseus asks questions that it doesn't always answer, but don't worry about a Lost-like disappointment where allsorts of things are promised and not delivered. The mysteries in Ship of Theseus & S. are mostly about identity and you can find your own answers.) If you're a bibliophile, this book is for you. If you enjoy an intellectual romance, this book is for you. In case your inserts fall out: http://sfiles22.blogspot.com/2013/01/... Thanks, Erica! 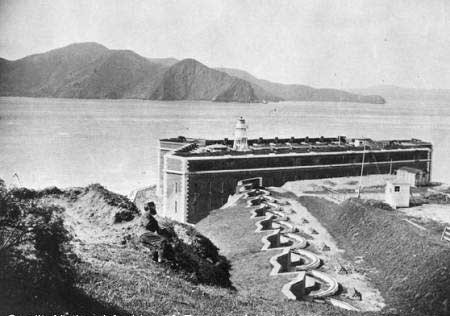 Random thing not really relevant but interesting to me because it's in my home town: the only place mentioned by name in "The Ship of Theseus" is Fort Point. S. is by far the most intricate novel I have read in the past few years. Even the monumental work of James Joyce in Ulysses cannot quite compare to the full flavour and power of the metafiction and post-modern styling of Doug Dorst's work (inspired by the ideas of J.J. Abrams). Certainly it is a major call to state that a modern work of this kind could be more of a puzzle than Joyce's depiction of Dublin and yet I believe that it is (or at least as convoluted a labyrinth in its way). However, I do not intend to state that this is by any means a work as profound as Ulysses, merely that its design is as wonderfully complex. Yet, it is a work that reminds me more of the writing of Jorge Louis Borges, had he ever written a full length novel. All hype aside one could easily dismiss this as a poor novel with a clever gimmick. And a poor novel with a clever gimmick is merely a shiny paperweight. However, S. appeared to me as the highest quality literature does. It appeared as a novel with multiple facets, themes and ideas. It is a novel with a nested narrative and so many clever little metalinguistic and postmodern tricks that following them all was a nice little challenge. At its core, however, S. is a novel within a novel which contains a story within a story within a story ad infinitum. The novel within is a fictional novel, The Ship of Theseus, by reclusive author V.M. Straka. Straka is revealed as an author with a love of bird motifs, hidden messages and the art of writing in foreign languages. However, Straka is a pseudonym (which in this case proves to be a fictionally fictional name for a fictionally real character who is in our reality Dorst himself) and as it occurs, no one knows the secret of his true identity, though many wish to know. This identity is concealed with the aid of F. X. Caldeira, the translator of Straka's novels and an individual who had come to love, but never meet, Straka. This fictional history of this author serves as yet another side story to the overall novel as an entire work and feeds into The Ship of Theseus as another side story. The Ship of Theseus as a novel in its own right is a clever invention in terms of how it is set up to exist as the work of a fictional author. In the footnotes within the book (the final work of Straka) there are plenty of hidden messages and one discovers that Straka himself has written this work as a message about his life and personality. This fictional world, in a clever touch, thereby presents a fictional reality. Further, the different chapters of the work are supposed to represent the different writing styles of (non-existent) Straka works gone before, a kind of pastiche of his other works so to speak. Or as the book itself explains, this work is a kind of palimpsest over a palimpsest (recurring). The plot of The Ship of Theseus ultimately follows the adventures of the titular character of Dorst and Abram's work - S. He is a man without a past and with a future and therefore preoccupied with his identity (a theme which continues to be discussed throughout the book - with characters affirming that they know who S. is currently but not who he was). Through a series of events, S. ends up aboard a mystical and almost ghostly ship. Even as S. leaves the ship to go aboard land, become part of a radical group (a group shown to be similar to one Straka himself believed in) and an assassin, and his identity is changing, so too does this ship continue to haunt him. The ship subtly changes and yet it remains the same. And even as time changes (in a kind of fantasy way) and S. seems to remain constant (a hint that he is a kind of metaphor within a metaphor) - particularly in his desire to rediscover one particular woman - so this ship continues to haunt the chapters of Straka's work. Of course, herein lies the secret to the title of this Straka novel. The ship of Theseus is a philosophical experiment also known as Theseus's Paradox. Essentially this paradox questions whether, if you replace piece by piece, the wood from an old ship with fresh wood, the reconstructed ship would remain the same. Various versions on the same idea have existed ever since, even questioning whether the ship remains the same if for instance you only replaced one part of it with another. Is it the same ship, or is it something new, some hybridised creation? Further as Thomas Hobbes questioned: if you take the old wood and replace it piece by piece and then rebuild that old ship with the old wood which, if any of the two ships created, are the original? Dorst's novel essentially on the whole questions this whole idea through the physically changing ship in the novel and also through the questions of identity: does S. himself stay the same as who he previously was or is he something new due to his lack of a past? Are we constantly changing piece by piece and becoming something new as people or are we always the same person, merely recieving refurbishing and redecorating throughout life? Is the 'me' I am now the same 'me' I was at 19 or am I now at 20 a different individual? The concept doesn't stop here. That would be selling this artwork short I believe. No, there is another story continued in the margins and highlighting the love affair we biblophiles have with those works we cherish. It is a flirtation with words, a marginalised relationship which is discussed and observed by us as onlookers as two individuals begin a detailed discussion of life the universe and everything! , love, literature and everything in between. It is this unfolding development (accompanied by inside notes, photographs and attachments) which turn S. into more than just a mysterious work of fictional post-modern indulgence, instead creating a monument to honour contemporary literature as a whole. Ugh. Gorgeous, brilliant concept, beautifully printed, but super tedious to read. A bad novel is still just a bad novel no matter how you dress it up. And the two students scribbling all over the bad novel? Who cares. In these times of Kindles, Nooks, and iBooks, a novel like S. is a really exciting breath of fresh air. It's truly a love letter to physical books and a great effort in interactive reading and storytelling. The novel, written in a collaboration between film director J. J. Abrams and novelist Doug Dorst, is a story within a story within a story. 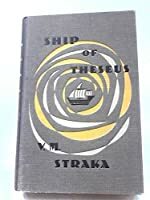 The book contains "Ship of Theseus", the final novel of the critically popular but mysterious author V. M. Straka (who disappeared under unknown circumstances) with strange footnotes by Straka's frequent translator F. X. Caldeira. The book's margins include a second story, read as handwritten notes between two college students, Eric and Jen, as they try to interpret the novel and investigate who Straka and Caldeira are, while growing closer. Inserted throughout the book are physical pieces of other correspondence between , articles, essays, hand-drawn maps, and postcards. Given how gorgeous the book is and how ingenious the concept is, I was terribly disappointed in how uninteresting the story was and how bored I was through the whole thing. The story in Ship of Theseus, of a man with amnesia, who has know idea why he has been kidnapped and sent on a dangerous journey, is...*YAWN*..... It has some interesting imagery but I found it pretty forgettable. The real story, found in the notes between Jen and Eric, is not only just as dull as the "Ship of Theseus" story, but the characters are also annoying. Eric was particularly irritating. Reading their back and forth notes got to be tiresome. I couldn't see for the life of me why Jen would be at all attracted to Eric. And once they meet, I couldn't understand why they would keep writing back and forth together in a library book. I couldn't get past that. Reading the book is a lot of work, which could turn into a fun project, but ultimately it felt like homework because I couldn't get into the characters and stories. 1) Remove the inserts and replace them with sticky notes describing them between the pages that they belong in. It was difficult trying to keep them from falling out while reading. Once you get to the page with the sticky note, you can get the corresponding insert so you have it while reading. 2) Read it chapter by chapter, including the Caldeira's footnotes. After reading a chapter, read the pencil notes (Eric's original notes to himself in the book) as well as the black and blue pen notes, (the initial back and forth correspondence between Eric and Jen). I sometimes read these while reading the chapter, if it looked like the note referred to something specific in the book's text. 3) After finishing the whole book that way, go back and read all of the notes written in Orange and Green ink, written when Jen and Eric go back through the novel again after their relationship deepens. 5) Then read the final black and black text. *Study the inserts as they're referred to. As you can see it can be pretty involved. If you're reading this, don't let this turn you off too much. This book deserves to be given a chance, and you may be one of the many who really love it! If you read it, I'd love to know what you thought. One day I will revisit this again and maybe I'll enjoy it more. It's sad, because the book is a great concept, but I wish the design and concept was used to service a better story. I really wished I liked it. But it's a great example of awesome style over little substance. What a fabulous looking book! Leave the inserted tidbits, where they are. You‘ll figure out at what point to read them. Here is one of the many webpages extr What a fabulous looking book! I followed the mentioned order. I mostly skimmed through the plain text though, after fully reading the first few chapters. And I left out the footnotes, because I hate footnotes. I felt pretty uninspired. There was no tension to the story and I didn‘t care for any of the characters. One star for plenty of weirdness. Otherwise it was boring and felt pretty pointless. I have never read Lovecraft, but the style reminded me somewhat of Edgar Allen Poe. Then the margin notes, another story in several parts, wrapped around Straka’s novel. Two protagonists swap notes about the book. After initial interest—cool idea—I lost that interest just as quickly. I didn’t care about the developping relationship between those two or about what Straka was up to or what it all means in the end. I have no interest in figuring out this particular puzzle. I don‘t know, it‘s all too academic for my taste. Quite a brain fart. If the plot had at least been good and well told! The book/the authors are just trying too hard to be clever. You lost me, sorry. OMG. I went to B&N and this came home with me and it is gorgeous and I haven't even taken the plastic off yet!! If I weren't reading way too many books at once right now, I'd just plop down and get going. hearts and souls and lives can themselves be sites of unimaginable suffering. "What is S.?" is quite probably one of the most difficult questions I have ever found myself trying to answer. S. is not s OMG. I went to B&N and this came home with me and it is gorgeous and I haven't even taken the plastic off yet!! "What is S.?" is quite probably one of the most difficult questions I have ever found myself trying to answer. S. is not so much a novel as it is an experience. S. is a commingling of at least five stories, maybe more. First, there is Ship of Theseus, a novel by V.M. Straka, which is the book in which S. takes place. Ship of Theseus is the story of a man who knows nothing of himself, and the only clues he has to his identity are a scrap of paper with a stylized letter S on it (See the cover) and a woman he sees in a bar who he thinks might know him. Before he can approach her, however, he is taken by rough men and bustled aboard a ship, which sets sail with him. And throughout the book, the man S. searches for himself and for this woman who he is so drawn to, all the while he sails out of time and is sent back into it to fight the evils of men. Second, F.X. Caldeira, the editor and writer of the forward and footnotes within the tome, is sending messages to Straka. Who, within the work, seems to have been sending his own messages to her. Theirs is a heartbreaking love story, discovered within the book by Jen and Eric. Third, Jen, an undergrad, finds a copy of Ship of Theseus in the library and starts to read it, and she writes a note in the book to the owner, who writes back. Eric, an expunged grad student, has been reading Straka since he was a teenager, and together he and Jen begin to discover even more in the text than he had already. And they, too, fall in love, through margin notes and a shared love of Straka's work and the mystery surrounding it. Fourth, Who was V.M. Straka? There is no shortage of theories, but no one knows for sure. It is this question that Eric and Jen (and others) are trying to answer. Fifth, What is the S.? A shadowy organization? A group of writers fighting against the evils of society? Another question Eric and Jen are working to answer. I KNOW, it looks confusing as hell. But it really isn't. I don't know how best to explain it beyond saying that it all weaves together beautifully and wonderfully and I really enjoyed every moment of this intriguing, mysterious ride. I wish V.M. Straka were real so I could read more of his books. and what ends there shall once more begin. First off - twenty ZILLION points for concept and execution - this is the single most pefectly designed book I've ever held in my hands. From the vintage cloth binding (with library sticker on the spine) to the I'd-swear-they're-really-written-in-pen margin notes to the (I am not kidding) musty old-book smell, this thing is flawless. And that's before taking into account the inserts - a map jotted on a napkin, legal pad letters and worn business cards, a yellowed obituary clipped from a newspape First off - twenty ZILLION points for concept and execution - this is the single most pefectly designed book I've ever held in my hands. From the vintage cloth binding (with library sticker on the spine) to the I'd-swear-they're-really-written-in-pen margin notes to the (I am not kidding) musty old-book smell, this thing is flawless. And that's before taking into account the inserts - a map jotted on a napkin, legal pad letters and worn business cards, a yellowed obituary clipped from a newspaper... so freaking cool! The story itself... The central novel rings true, the modern day scholars are likable and smart, and the structure is so well-designed that it's never confusing even when you're turning the book on its side to read it. Every page is a little thrill, like reading someone else's journal. Recommended for fans of Griffen & Sabine, Pale Fire, Possession or House of Leaves. In other words, most people on this site, I imagine. What did I think? I finally finished reading this book hours ago and my head is still spinning. As I turned the last page I remember thinking, this is unreviewable, or at the very least unrateable. I'll try to articulate some thoughts - that will be the review - then at the end I'll see if I can come up with a number. Firstly, I have to put it out there - this is the highest of high-concept books I think I have ever read. 5+★ for that. I was so excited to collect it from the library, along with a What did I think? I finally finished reading this book hours ago and my head is still spinning. As I turned the last page I remember thinking, this is unreviewable, or at the very least unrateable. I'll try to articulate some thoughts - that will be the review - then at the end I'll see if I can come up with a number. Firstly, I have to put it out there - this is the highest of high-concept books I think I have ever read. 5+★ for that. I was so excited to collect it from the library, along with all the warnings and instructions on how to manage the 29 or so inserts the book contains. I handled them reverently throughout the entire reading period, and am happy to say they will be returned in the right places and in as good condition as they were loaned. Along with the extensive margin notes, these are what makes S. such a unique reading experience. Which brings me to my next point. Once I had the book in my hands, I faced an unexpected dilemma. How do I approach this? How do I read this? Luckily there is an army of readers completely besotted with this book, who are willing to advise on this very issue. You don't even have to leave Goodreads to get it (although you can - there are plenty of forums and blogs if you need to go further). So I did my research and what I came away with is that if you have the time and the patience, you would read this 457p book 4-6 times. That is, you would take between 4 and 6 passes at it, in order to get the full chronological effect of how the story unfolds. The number is rubbery because there are opportunities to streamline/consolidate the process if you wish. First pass is 'the book' - the actual story of S, as set out in the traditional, typefaced pages of the book, including footnotes. Second pass would be the margin notes made by Eric, the solitary scholar. Third, the initial to-and-fro margin notes of Eric and Jen. Fourth, the later margin notes of Eric and Jen, as the world around them begins to get a little creepy and paranoia sets in. Fifth - etc, etc. You can easily use the colours of the margin notes to distinguish which era they are meant to belong to. Then of course there are the inserts. For those, you just take the clues from the margin notes, as to when they fit into the story. Sorry, that was a little long-winded. Not having the time nor the patience for all that, I effectively read it twice. I would read - by chapter or section - the 'story of S', then go back and read the corresponding margin notes and inserts. 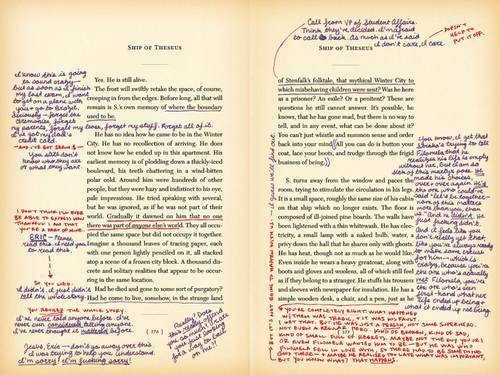 I tried to organise the reading of the margin notes according to the colours, but this wasn't always possible. In the end, I think that by taking this shortcut I probably missed quite a lot of the chronological nuances, and consequently there were times I wasn't really sure what was going on. I'm thinking maybe about 4★ for the reading process, which was clearly very active. Oh, and this explains why I had to do so many status updates - so I could remember where I was up to, as my bookmark often was not reliable enough on its own. Now to the story. I generally love a dual narrative structure, but this example is a little bit different. Although the two narratives do have an obvious connection, its not a connection in the usual sense. I preferred the story of Eric and Jen (in the margins) to the story of S (in the book). In fact, if it was just the story of S, it's not the sort of thing I would normally read. I did appreciate how each chapter of the story of S ended in a bit of a cliffhanger though, which kept it interesting. All in all, I think maybe 3★ for the story. Would I recommend it? Yes, definitely. This is the perfect book for a buddy-read because there's so much to discuss and theories and ideas that need to be aired. Or even just for readers who are looking for something a bit different. Maybe for people who are a bit 'off' reading, and need something to reignite their interest. 1) This is the most intricate piece of literature I have ever read. S. is nothing like anything I've read before. The main story is Ship of Theseus written by a writer no one knows the identity of who goes by V.M. Straka. On its own is a wonderful story. The other story is about Eric and Jen, two readers brought together through this book, communicating in messages in the margins. The color of their pens changing as their relationship evolves. This book is so in depth you need to look up directions on how to read it. I started reading it incorrectly, but thankfully by reading other reviews discovered the right way and it was wonderful to watch the pieces fall into place. Its a brilliant read. A mystery, a love story and more. E: It's extremely cool how the words can stay the same but their meaning can change. J: Because the reader changes. Molto in difficoltà nel dare una valutazione secondo canoni standard, ma direi almeno 4,5 (arrotondato per eccesso)! Ebbene, lo ammetto: con un misto di apprensione, curiosità, mistica devozione per questo esperimento letterario così discusso, ho iniziato la lettura di "S. La nave di Teseo" (solo "S." nell'originale). [No, un attimo. Prima c’è stato un lungo, complesso e logorante processo di decisione: lo prendo? [No, un attimo. Prima c’è stato un lungo, complesso e logorante processo di decisione: lo prendo? Non lo prendo? Ok, sì. No; Meglio di no. Insomma, tornando al punto di partenza: dopo lungo meditare, alla fine l’ho comprato (n.b. si tratta della versione in lingua originale, quindi ogni mio riferimento a impaginazione, confezionamento, materiali e inserti vari, ect. è a questa; ma credo che quella italiana sia altrettanto curata) e non è stato facile evitare gli spoiler in questi anni (e, non so come, ma ce l’ho fatta). In primo luogo, il profumo. Ti assicuro che vedersi tra le mani un libro "invecchiato" (le pagine sono davvero "consumate" benissimo e il libro si presenta come un rispettabile e venerando libro in prestito) e sentirne, però, il peculiare odore di "libro nuovo" è qualcosa di indescrivibile (quasi esaltante per una maniaca dei libri come me). In secondo luogo, le annotazioni: sono davvero curate (penna, lapis, pennarello…). Ogni impronta ha il suo spessore, la sua consistenza tanto che quasi avevo paura di passarci la mano sopra, temendo di sbavare l’inchiostro, che comunque in alcuni punti è più o meno marcato già di suo. A questo punto, ti starai chiedendo: hai pagato circa 30€ un libro invecchiato e scarabocchiato da due mani sconosciute? Ebbene sì. Procediamo con ordine. La storia (spoiler-free). Due giovani, maschio e femmina, non si conoscono, per il momento, e hanno solo una cosa in comune: la passione per la lettura. E si "incontrano" per caso, quando lui lascia questo libro di V.M. Straka (La nave di Teseo) e lei lo trova. Da qui, inizia la loro corrispondenza, il loro scambio di idee, opinioni, consigli e esperienze e, sì, anche la loro indagine tramite un vettore molto particolare: il libro stesso. Tuttavia, i protagonisti della vicenda non sono solo due. Assieme a loro, e avvolti dal più profondo mistero, troviamo Straka (l’enigmatico autore de "La nave di Teseo") e il suo traduttore, F. X. Caldeira, che, secondo alcuni, altri non è che Straka stesso. Ma il "mistero Straka" si complica ulteriormente, vista la peculiare dipartita dello scrittore e il suo peculiare passato, in cui Straka sembra essere responsabile di complotti, assassini, disastri e altre cose tutte poco piacevoli. Insomma, si procede per cui in parallelo: da una parte, lo scambio chiamiamolo "epistolare" tra i tue giovani; dall’altra la storia narrata da Straka (la sua ultima storia) e le note del traduttore (che raccontano un'altra storia ancora). Non è finita qui, perché il mistero s’infittisce sempre più, viste le incognite e i dubbi che l’esistenza misteriosa di Straka (e del suo traduttore) pone. A questa narrazione già molto articolata, dobbiamo poi aggiungere gli inserti: stralci di giornali, documenti confidenziali, cartoline, annotazioni su carta intestata e su tovaglioli di carta (non scherzo: c'è per davvero un tovagliolo di carta tra le pagine del libro!). Insomma, curato nei minimi dettagli e, già solo per questa attenzione, il libro vale tutti i 30€ della versione cartacea (di fatti, gli autori stessi, vista la natura particolare del loro stesso romanzo, sconsigliano la versione digitale e, per certi aspetti, non posso non dargli ragione). Devo ammettere d’essermi ritrovata un po’ spaesata le prima pagine: cosa leggo? Prima il testo del libro? Prima le annotazioni? O i documenti chiusi fra le pagine? Leggo in contemporanea? Ma, alla fine, "allarme" rientrato: ben presto si comprende in che ordine leggere e a cosa dare precedenza (o, comunque, si trova un proprio schema da seguire per procede, senza intoppi, nella lettura). Ogni colore e ogni penna/lapis/pennarello usato distinguono non solo le annotazioni dei due ragazzi, ma anche il "tempo" in cui queste sono state inserire sulle pagine. A questo proposito, ci tengo a fare una piccola nota: personalmente, ho preferito leggere testo, documenti e note insieme (tenendo presente che appartengono a tempi narrativi diversi), ma non esiste un ordine giusto o sbagliato per procedere. Insomma, vedo che sto scrivendo un poema, ma non volendo (né, ahimè, potendo) gareggiare con il cantore greco, mi accingo a concludere, tirando un po’ le fila del discorso. L’idea è innegabilmente affasciante oltreché originale e realizzata davvero in modo magnifico. Si entra in un doppio mondo in cui la finzione del libro e la finzione dei due ragazzi s’intrecciano così bene e in maniera così indissolubile da rendere la "finzione" (mi scuso della tripla ripetizione) davvero perfetta. Personaggi perfetti. Leggiamo le loro note e comprendiamo il loro carattere; conosciamo il loro passato e il loro presente (purtroppo, non tutto il loro futuro). Per questi motivi, chapeau! a entrambi gli autori (l'idea è di Abrams; gli scritti di Dorst) per la cura e l’attenzione, quasi maniacale, nella costruzione dell’intera storia (oltre, già detto, per l’originalità). Ora, se proprio devo trovare un pelo nell’uovo, la storia, "scritta" da Straka (surreale, densa di metafore, messaggi cifrati, ect. ), considerata di per sé non è che sia un granché (se, ripeto, letta da sola); anche perché è un po' confusa. Ciò che rende avvincente la vicenda è l’intreccio che si crea tra i vari livelli narrativi. Devo, però, ammettere che, verso la fine, stavo diventando un po' insofferente: ok, abbiamo capito che la questione (non solo quella presente dei due ragazzi, ma anche quella passata di S., chiunque esso rappresenti) è molto segreta, molto ingarbugliata e molto pericolosa, ma… andiamo avanti! Arriviamo al punto! Se l'idea e, soprattutto, il modo in cui questa è raccontata piace, allora ti consiglio la lettura, perché si tratta davvero di un esperimento interessante (e sarebbe bello vedere altre storie, magari anche di autori diversi, raccontate in questo modo). Certo, non si tratta di un libro perfetto (almeno dal mio punto di vista). Come dicevo ci sono alcuni punti della trama che, un po', ristagnano; altri che rimangono oscuri (ma può anche darsi che sia stata io incapace di spremermi troppo le meningi per arrivare alla soluzione; anche se, in rete, si trova davvero qualunque tipo di illazione - alcune, secondo me, un po' azzardate). Questo per dire che, alla fine, la questione non è così chiara per la maggior parte delle persone come (forse) pareva invece agli autori (sempre che la loro intenzione non fosse quella di lasciarci tutti sospesi in un limbo letterario). Mi aspettavo, sinceramente, qualcosa di più dal finale, soprattutto con riferimento alla vicenda dei due ragazzi (e, invece, si rimane in sospeso come se si fossero dimenticati di tirare le fila del discorso). In ogni caso, si tratta di un libro, di una storia che va seguita e che richiede al lettore non solo di leggere, ma anche di ragionare e interpretare gli indizi che gli vengono forniti (per esempio, io ho avuto delle serie difficoltà con la ruota EOTVOS). Difficile inquadrare La nave di Teseo in un genere specifico e difficile anche dare una valutazione secondo canoni standard. More literary-board game than novel, S. is way more over-the-top gimmicky, way more complex, and waaaaay more well written than I expected. It's a thrilling experience and a wonderful narrative on the nature of escape and commitment, reading for pleasure VS reading for knowledge, the power and limitations of writing and reading. Leider konnte ich die Geschichte nicht greifen, es gab keine Geschichte! 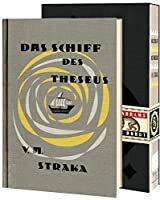 Der Protagonist von „das Schiff des Theseus“ hatte Amnesie und wusste nicht wo er war und wer er war und irrte herum, die Studenten Eric und Jen waren sehr sympathisch aber haben zu 85% gefachsimpelt und „FXC“ (übersetzer) hat kritische Fußnoten beigetragen, die ich ebenfalls nicht verstanden habe. Die Aufmachung verlor leider rapide seinen Reiz, weil es niemanden dieser Personen je gegeben hat und all das nie passiert ist. What did I think of this book.... Many things, actually, and I'd rather leave an hour infront of me to compose a decent post about it rather than hastily throw out a bunch of thoughts. This book deserves that. But briefly, I found it thrilling, slow, thought-provoking, snobbish, relevant, confusing, brilliant, and it contained more than one "wtf" moments for me. I absolutely loved it, enjoyed the ride, disliked some of the overly-literary atmosphere that spills off the story (because most of that What did I think of this book.... Many things, actually, and I'd rather leave an hour infront of me to compose a decent post about it rather than hastily throw out a bunch of thoughts. This book deserves that. But briefly, I found it thrilling, slow, thought-provoking, snobbish, relevant, confusing, brilliant, and it contained more than one "wtf" moments for me. I absolutely loved it, enjoyed the ride, disliked some of the overly-literary atmosphere that spills off the story (because most of that just goes over my run-of-the-mill head), but for that Jen and Eric's story helped me along with that. Wish this had been one of the "required reading" books in high school, I might have passed English Lit. On top of it, I know I'll be reading it again down the line. The whole package of the book is fantastic. I cannot rate that high enough. The book is actually sewn, just like the OLD books my parents had, and some of the old books I've collected on my own. Just holding (honestly, just holding!) a book like that is fun for me (yes I know, I really do need to get out more). Then with all the old postcards, photos, and the map-on-a-napkin... I swear I'm back in my childhood looking through books people would let me look through, and the big prize is when you find a note someone left in it. What a treat, it is like meeting a new person. How cool is this? It's a story involving a book in which said book is the actual book, and the story about it is told through scribbled notes and ephemera found on/within the pages. Is it gimmicky? Absolutely! But who doesn't love a heady dose of such things every once in a while? This is one of the most beautifully-presented works of fiction I’ve ever seen. It’s also really quite boring. I should add that I haven’t finished it, and I probably won’t. It has been sitting on my printer for weeks, mocking me. But I can’t go back to it! And that makes me sad. Before I can explain why it makes me sad, my first sentence needs a little unpacking — and I mean that quite literally. The book itself is a hefty, weathered-looking hardback bearing the title ‘The Ship of Theseus’ on it This is one of the most beautifully-presented works of fiction I’ve ever seen. It’s also really quite boring. I should add that I haven’t finished it, and I probably won’t. It has been sitting on my printer for weeks, mocking me. But I can’t go back to it! And that makes me sad. Before I can explain why it makes me sad, my first sentence needs a little unpacking — and I mean that quite literally. 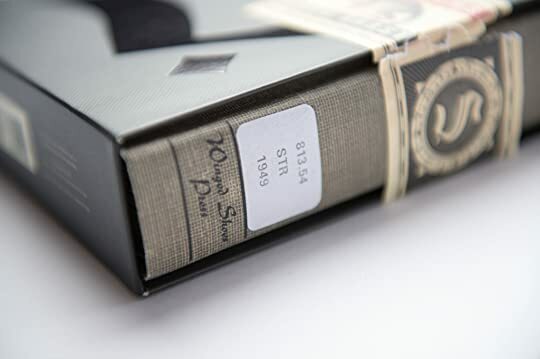 The book itself is a hefty, weathered-looking hardback bearing the title ‘The Ship of Theseus’ on its spine, along with a library’s Dewey Decimal sticker. 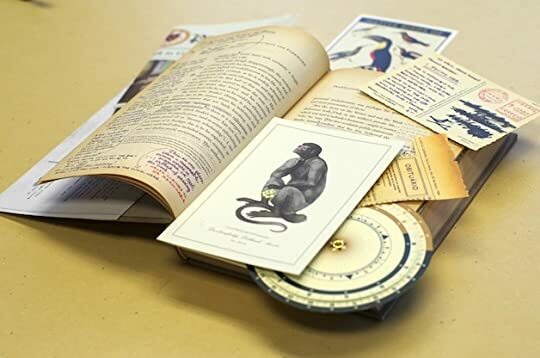 The hardback comes inside an elegant slipcase of lightweight black cardboard which bears the title ’S’, and the names of Doug Dorst and J. J. Abrams. It is all very handsome. And the book is actually secured within its black sleeve by a paper band which you need to cut away before you can take it out and open it. The reason for this soon becomes clear: as soon as you take the book out and start to leaf through the pages, some things fall out. And there are a lot of things in the pages. There’s a postcard with some handwriting on the back. There’s a napkin with a map hastily scribbled on it. There are a number of letters. There’s a code wheel. There’s an extract from a college newspaper. And there are many, many more objects, all of which have been placed strategically throughout the book. While I don’t think you’d ever mistake one of them for the real thing, they are all really well produced: the paper napkin, for example, is printed on the exact kind of napkin paper you’d actually get in a coffee shop. Anyway, now that you’ve got the book open, you can start actually reading it (which you probably weren’t able to do in the bookshop because it was sealed inside its black sleeve). 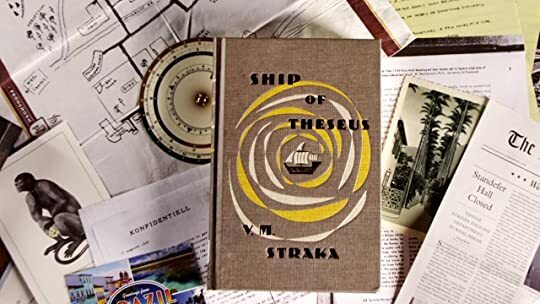 You soon find that you are reading a book called ‘The Ship of Theseus’ by a man called V. M. Straka. But you are also reading the footnotes by the person who translated this book. And in the margins, you are also reading the hand-written comments of two people: a young female student and an older male student. These two are in a kind of textual dialogue because in this world they are leaving the book around for the other to find in their college library. They bond over their shared love of this author, and so their writing is both a gloss on Straka and a sort of semi-flirtatious conversation about themselves. As with the items within, the comments are immaculately printed: they do look exactly like handwriting alongside the hard text of the actual novel. Whether the comments make for interesting reading is a different matter entirely. I’m a sucker for this kind of thing. I really like novels which play with form in this way. I took the name for my blog from the technique of writing in the margins of a text. And I wrote my undergraduate dissertation on ‘Pale Fire’ and ‘House of Leaves’ because I love those books. I make a habit of seeking out stuff like this where I can because there aren’t very many around, so I bought this book knowing nothing at all about it or the author(s) or how it came to exist. I write this not because I think it makes me an authority, but because it makes me a potential fan. I was absolutely willing to entirely submerge myself in this fiction. I was hoping I’d be so swept up in it that I would come to believe all those things that fell from the pages were real enough to be worth caring about. All of this is stupid, I suppose, but that’s how I felt. And I was disappointed. The essential problem is that the central work of fiction here (the actual novel ‘The Ship of Theseus’) doesn’t stand up to the kind of intense personal and investigative scrutiny that we are told it has. Here are all these people poring over this text in the margins, but the thing they are poring over is little more than a turgid mass of tropes from mid-c20th European fiction. It’s so wedded to the possibility of suggesting a grand conspiracy, so full of implied analogies and metaphorical readings, that it never actually goes anywhere remotely interesting as a story. How fun it would be if this were a playful gothic romp in the style of someone like Carlos Ruiz Zafon, I kept thinking; but it just never quite gets off the ground in the same way. And so all of the beautiful little things that fall from the pages lack any kind of narrative weight. They're just pleasant little garnishes to a main meal forever postponed. So I think I made a mistake. I read this all in one shot and I don't think that's how I should have read it. 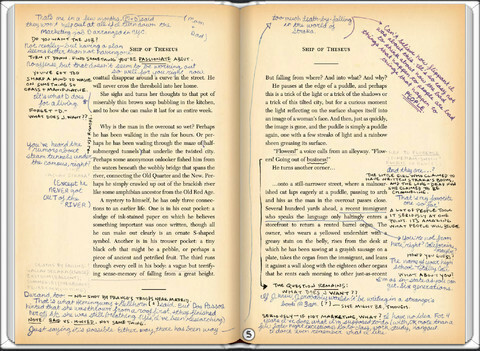 J.J. Abrams had a clever idea about reading a book and seeing a couple writing to each other in the margins of the book. He turned to Doug Dorst to pen the story within a story. S. is a story about Jen and Eric reading Ship of Theseus by V.M. Straka. Jen and Eric are trying to figure out who Straka is. (turns out he was a mysterious author with a mysterious past) Ship of Theseus is about a man who can't remember who he is but finds himself in the midst of multiple events of death and (again) mysterious consequences. I think the best way to read this clever story is to read Ship of Theseus by itself and trying to ignore the writing in the margins. Once you finish Straka's book, go back and check out the margin notes and the plethora of "inserts" that Jen and Eric leave each other. I think the idea was good but I couldn't really get into either story. There were moments when the mystery man in Ship of Theseus gets into some crazy action and I was glued to the tale. But then he would jump back into the water, get located by the ship and things would die down and become incredibly boring. I understand that Straka's style of writing is of a bygone era but most of that tale was hard to slog through. Jen and Eric's story (their interaction with each other) follows a similar growing-excitement-only-to-be-let-down. I was getting geared up for an unseen chase by villains who are setting fires but instead it disappeared. Did I miss something of that plot line? All in all, I will absolutely read this book again. There are clues and codes spread out. It is a J.J Abrams concoction remember. But I was very disappointed with S. I enjoy a good mystery but I never connected in a way I was expecting. As for me this one started with such a novel idea but then finished sadly uninterested. "S." is an act of love. Love towards reading, and towards the book as a physical object. The concept is wonderful. Many other books "pretended" to be some mysterious manuscripts by fictional authors, or translations of obscure novels, and this was actually a technique in fashion a few centuries ago (i.e. see The Betrothed, Alessandro Manzoni). But with "S.", something stands out far above everything similar that's ever been created: the EXECUTION and the attention to DETAILS. By the time you get "S." is an act of love. Love towards reading, and towards the book as a physical object. The concept is wonderful. Many other books "pretended" to be some mysterious manuscripts by fictional authors, or translations of obscure novels, and this was actually a technique in fashion a few centuries ago (i.e. see The Betrothed, Alessandro Manzoni). But with "S.", something stands out far above everything similar that's ever been created: the EXECUTION and the attention to DETAILS. By the time you get to read the hand-written letters of Eric and Jen, you will be so fully sold on their narratives that you'll feel like you are actually holding their original hand-written letters. I felt like the strongest charachters, the ones who come alive in the most powerful and immediate way, are Eric and Jen. With their lovely, different hand-writing styles, already by itself saying a lot about themselves, they turn into real people within the first few pages. Initially I was afraid this was going to end up being too "young adult" in its content, but I don't think that's the case. Of course - let's be objective: the story between Eric and Jen, at the end of the day, is a love story between two young people, very well developed but not much more than that. And the plot of "Ship of Theseus" reads as if it was the novelization of an "adventure" videogame. Yes, a good and interesting videogame, but still, that is the level of depth that you can find here. Ok, there ARE some pills of wisdom here and there in the "Ship of Theseus", but as a book by itself - if it was a completely separate book - I would rate it no more than 2 or 3 stars. It moves forward with a technique very similar to the TV series "Lost", where you have a constant dripping of mystery upon mystery, but you never get to full resolutions that you can move on from. I don't dislike this style, but it's not my favorite. However, that is not the point! The point is that this is a fantastic, magical experience for a book lover. One that will ask you some time in order to be fully appreciated, also because the book is relatively long, but that if you do give it time, will draw you in and make it worth it. Five stars for the gargantuan amount of fun I had, in the last three weeks, in reading this book. It made me become a kid all over again, and enjoy every single part of it as I was going through it. So much fun. I really enjoy the concept of the book and JJ did a great job promoting the book with the trailers. I was hooked immediately. Even with that as the background, the book is a bit overwhelming when you try to tackle it. There are all the clue pieces, the dialogue between Eric and Jen and then the story itself. I was having a tough time trying to read the story and the banter while keeping it all together in my head. I decided to pull out the clue pieces(catalog the pages they are stuck between, it I really enjoy the concept of the book and JJ did a great job promoting the book with the trailers. I was hooked immediately. Even with that as the background, the book is a bit overwhelming when you try to tackle it. There are all the clue pieces, the dialogue between Eric and Jen and then the story itself. I was having a tough time trying to read the story and the banter while keeping it all together in my head. I decided to pull out the clue pieces(catalog the pages they are stuck between, it's important) and just read the story ignoring Jen and Eric. It's hard to do but I think it helps. The idea being I will read the story first, as Jen did, then go over it a second time reading Jen and Eric's banter at which point the clue pieces will be introduced. This will give me a greater depth of knowledge when trying to put the clues together. I have not completed the story and don't want to drop any spoilers so this review is more of a guide book on how I thought the best way was to tackle the mystery. I'm sure other people will have different ideas and my plan may change as I progress so I will add updates as I move through the process. If anyone reading this has a better ideas or thoughts to share please comment below, would love your feedback.